Bounty of the season. A holiday cheese basket on display at Table of Content General Store in the Center. There’s plenty of holiday bustle around the Island leading up to Christmas. BEVERLEA WALZ PHOTO | Jack and Camille Anglin, owners of Jack’s Marina, said like most businesses Jack’s had a slow start but business picked up as the season progressed. Summer may not be technically over, but traffic tells a different story. It’s also that time of year when business owners have some breathing room to cast an eye back on a season’s passing. Is the road back from fiscal meltdown five years ago finally looking smoother? For most owners, if the road isn’t paved with gold, the footing is a lot more solid than it’s been. Amber Williams, of the accounting firm A&A Williams, said she’s hearing summer business was “a little mixed.” It might have been better if Mother Nature had started cooperating a bit earlier in the season, she said. Foul weather in May and June were worrisome, but in July, the sun came out and so did the tourists. “July was wonderful,” said Chequit and Ram’s Head Inn co-owner Linda Eklund. August was “good,” she said, although her husband James complained about a week of terribly hot weather that kept a lot of people indoors. Still, they pronounced the overall summer season positive. And with 50 percent of available dates for weddings at the Ram’s Head Inn booked for 2014, they’re optimistic. Mr. Eklund has also seen an upswing in the construction business. A partner in Reich/Eklund Construction, he said either people can finally afford to tackle the projects they put off since 2008 or have decided that the economy isn’t going to get much stronger in the near future and they’re going ahead with projects they’ve wanted to do anyway. For Jack Kiffer at The Dory, perhaps the May/June rain put him on an even keel with other restaurants. “I’m not broke,” Mr. Kiffer said. He did see his regulars and a lot of new customers through the summer. But he worries whether all those paying with credit cards will be able to pay their bills when they come due since he’s still hesitant about the economic recovery. Island restaurant business, by and large, is tracking with national trends. A National Restaurant Association study showed an increase in electronic sales throughout the United States. Plus, association figures showed 46 percent of “fine dining operators” planned more capital expenditures this year, while 50 percent of family-dining restaurants were increasing sales of packaged foods for people to reheat at home. Some other data nuggets on American dining habits: Table-service customers were more likely to be male, older, with higher income levels, while takeout customers were often younger and living in households with children. There has also been a trend for convenience stores and grocers to expand food service offerings this year, according to the restaurant group. That should be good news for businesses like Schmidt’s Market in the Center. Schmidt’s may be new to Shelter Island, but has thrived in Southampton for years. Co-owner Dennis Schmidt said the summer here was “great” and he expects business will continue to thrive in the off season. “I think we’ll be fine,” he said. At Jack’s Marine, both Camille and Mike Anglin acknowledged the slow start, but benefitted from many new Islanders who purchased property here and visits from people who, prior to Sandy, went to the Jersey Shore. “It’s not a barn-burner,” Mr. Anglin said. “But it’s certainly not been a bad year,” Ms. Anglin added. One element that helped business was a reduction in costs from some of their suppliers, Mr. Anglin said. “They finally fell into line,” he said. Still, other costs such as insurance and taxes put the “squeeze” on merchants, Ms. Anglin said. For Jack’s Marine, the diversity of the business has helped, even through the recession. People who couldn’t afford to hire contractors did more work themselves, requiring more hardware products, Mr. Anglin said. Ivy Ladder’s Shirley Ferrer also reported good summer business, which has spurred her to open on weekends until Christmas. Nationally, the economic recovery is “still muddling forward,” according to the National Retail Federation. It calls 2013 economic growth “disappointing,” but said that’s mostly the result of weak growth in wages, job creation and slower business investment. Maggie Davis at Shelter Island Yoga and Fitness called this summer “a little out of sorts. It felt like it was over before it even got started.” She said the weather had an impact on her business and there were more outdoor classes and aquatic exercise sessions. “In my case I think it mostly had to do with the weather — a wet cold June and a blistering July — and numerous rain cancellations for pool exercise.” She also said her business was affected by many of her clients traveling this summer so they weren’t on the Island as consistently as in past summers. Still, income was similar to last summer, Ms. Davis said. But one owner was unequivocal about the state of his business. 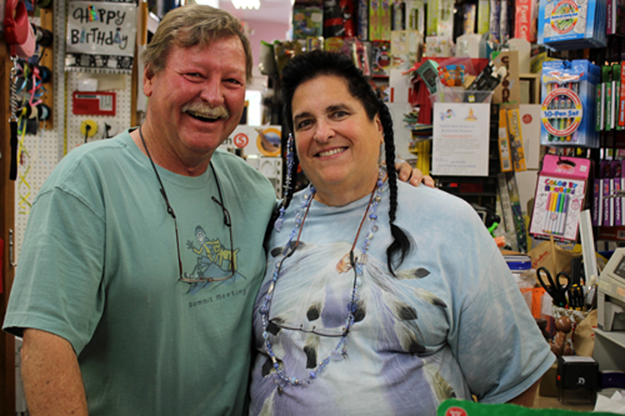 “Customer confidence isn’t there,” said Greg Ofrias of the Shelter Island Pharmacy.